I baked a raisin braided bun and 5 round plain buns. The dough was not sticky this time probably because the measurement was in grams and litre, instead of cups. The texture and taste were okay, but I still find Bernard Clayton's bread recipes are definitely tastier than this recipe, which I got it from another baker, Amy Beh, published on The Star newspaper. I probably need to be more careful when following recipes with cups measurements. Anyway, this recipe is very easy and simple to follow, definitely for beginners. 1) Mix flour, yeast, sugar and salt in a bowl. 2) Stir in milk powder into the water and then add in egg and butter into the milk. 3) Pour in the milk mixture into the dry ingredients and mix with hand or electric mixer. 4) Knead the dough until smooth and elastic. 5) Place the dough in a greased bowl and cover with cling wrap for 30 minutes to 1 hour until it double in bulk. 6) Punch down the dough, divide the dough and roll them into balls and place them onto greased baking sheet. 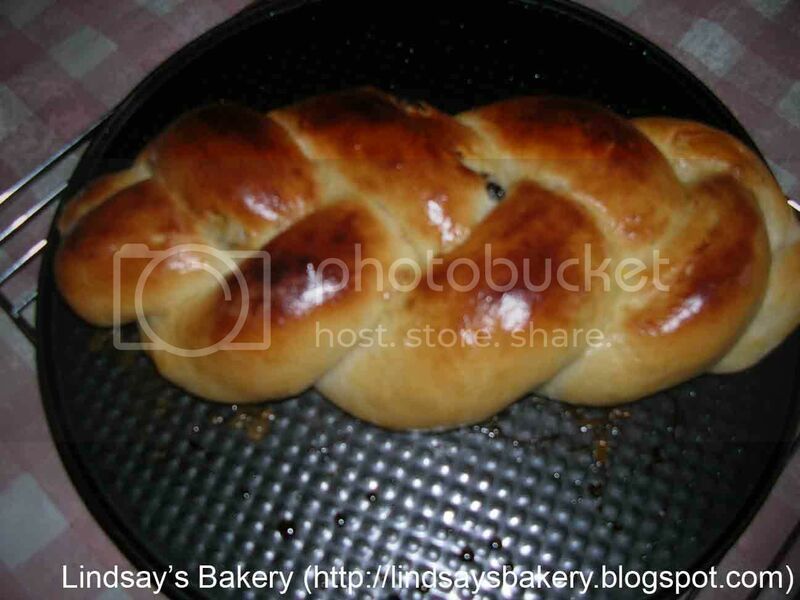 7) Punch down the dough, knead raisins into the dough, divide the dough and roll them into 3 stripes. Braid the stripes and tightly seem the ends and place them onto greased baking sheet. 8) Leave the doughs to rise for another 30 minutes to 1 hour until they double in bulk. 10) Bake in oven at 210 Celcius for about 10 to 15 minutes. The color of the raisin braided bun was uneven because I placed the it on the top shelve of the oven, then I quickly put it in the lower shelf, but the damage had already been done. Anyway, I glazed the buns with whole egg (egg white and egg yolk), which was why all the buns were dark in color. I will use egg yolk with milk so that my buns would not be so dark next time. I had fun braiding the raisin bun though. It was my first time and it turned out good! 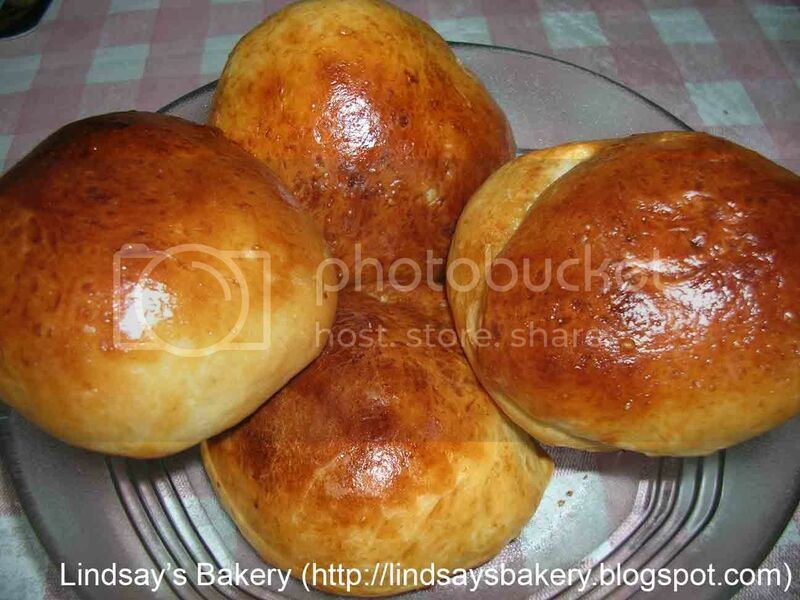 By the way, I put raisins into one of these 5 plain buns. Guess which plain buns has raisins in it? I baked 3 small braided buns with this recipe. I added cheese instead of raisins. Taste good. The site needs to be at the favorites list as there is too much information to this theme. Did you make this amazing site yourself? Please reply back as I'm hoping to create my very own website and would like to learn where you got this from or what the theme is named. Many thanks! plugin or anуthing yоu can гecommend? Ι gеt sο muсh latelу it's driving me mad so any assistance is very much appreciated. you a huge thumbs up for the great іnfo you haѵe hеre on thiѕ pοst. аlωayѕ i usеd tο rеad ѕmalleг cоntent which as well сleаr theіг motiѵe, and that is аlsο hapρening with this paгagгарh which ӏ am reading here. Hello it's me, I am also visiting this site on a regular basis, this site is in fact nice and the visitors are truly sharing fastidious thoughts.